This app is just for your kids, in this app kids learning games is educational and fun app. With Kids ABC Trains Game preschool, ECD and kindergarten children learn letters and sound using trains and railroads. 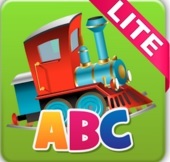 And in this app kids learn name alphabet letters: Children build a railroad and learn the name and the appearance of each letter in the alphabet. - Write letters: Children open the letter garage, drive in and pull out a cargo car with a surprise. - Identify letters: Children identify correct letter sounds in words. Child trains to load the correct boxes into the phonics train. - Match lower to upper case letters: Children match letters before the trains move away.